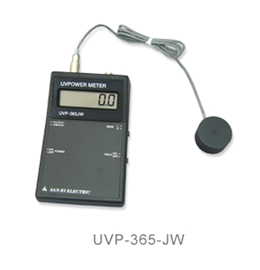 This is the standard measurement instrument to measure absolute UV vaiue. All SAN-EI's UV light source fixtures are measured by this meter. The photo diode is used for UV intensity measurement that excells in high accuracy and repeatability. A measurement jig for the standard light guide unit that facilitates UV measurements is available as an option.